Pope Francis has issued the Catholic church's most comprehensive acknowledgment to date for abuse perpetrated by its representatives here. Reading from a handwritten note at the mass in the Phoenix Park this afternoon, Pope Francis asked for forgiveness for the sins of the church, its clerics, and the hierarchy who did not take charge. "We ask forgiveness for the abuses in Ireland, abuses of power and conscience; sexual abuses on the part of qualified members of the church," said Pope Francis. "In a special way, we ask forgiveness for all the abuses committed in various types of institutions run by religious men and women and other members of the church and we also ask forgiveness for all the cases of labour exploitation to which so many young people were subjected. We ask forgiveness for the times that, as a church, we have not looked at the survivors of any type of abuse with compassion in the search for justice and truth, and with concrete actions. "We ask forgiveness for some members of the hierarchy who did not take care of these painful situations and kept silent - we ask forgiveness," he said. One of the most notable applauses was when the Pope asked for forgiveness for "all the times single mothers had been told that to seek their children, whom they had been separated from, was a mortal sin, and sons and daughters who were told the same". He said, "This is not a mortal sin", to which he received applause. 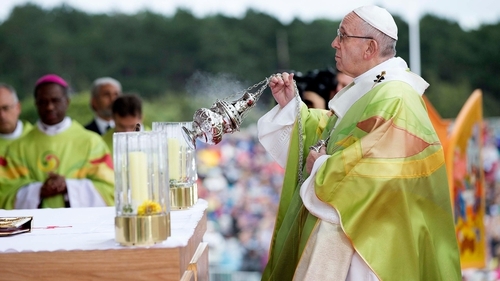 Tens of thousands of people gathered in the Phoenix Park for the Papal mass, which marked the closing of the World Meeting of Families. Pope Francis departed from Dublin Airport just before 7pm, bringing to an end his two-day visit to Ireland. Earlier this morning, Pope Francis begged for God's forgiveness for the "open wound" of clerical abuse in Ireland as he called for "firm and decisive" action to secure "truth and justice". 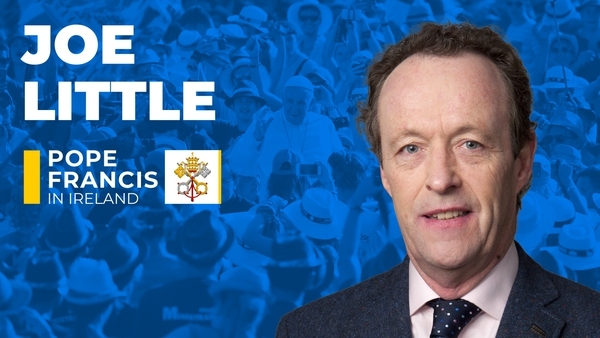 He made the comments as he addressed 45,000 people at the Marian Shrine in Knock ahead of leading the Angelus prayer. Thousands of pilgrims who braved the rain to see the Pope applauded as he urged decisive steps to bring truth to the victims. "None of us can fail to be moved by the stories of young people who suffered abuse, were robbed of their innocence and left scarred, distanced from mothers, abandoned, and left with painful memories," he said. "This open wound challenges us to be firm and decisive in the pursuit of truth and justice. "I beg the Lord's forgiveness for these sins and for the scandal and betrayal felt by so many others in God's family." I ask our Blessed Mother to intercede for the healing of the survivors of abuse and to confirm every member of our Christian family in the resolve never again to permit these situations to occur. Pope Francis flew into Ireland West Airport arriving shortly after 9.30am before he was driven the 20km journey to Knock by car. He then transferred to a popemobile that toured the grounds of the shrine as he greeted pilgrims. The Pontiff said he had used a period of private prayer in the shrine to remember the families of Ireland. Singling out the people of Northern Ireland, he said he hoped the path to reconciliation would continue. At least 1,000 people gathered for a silent vigil in Tuam, Co Galway to remember the Tuam Babies this afternoon, while thousands also attended the Stand4Truth event in Dublin to show solidarity with victims of institutional abuse. The crowds assembled at the Town Hall to walk to the former site of the Tuam Mother and Baby Home. They walked in silence to the site where the remains of a significant number of babies were found in septic tanks. They recited the children's names and lit candles in their memory. In Dublin, thousands attended the Stand4Truth event in Dublin to show solidarity with victims of institutional abuse. Organisers of the event said it was not a protest against the Pope’s visit but to provide a space for survivors who feel excluded by the main events. Campaigners said the Pope’s visit had triggered painful memories for survivors of institutional abuse. The Coalition of Mother & Baby Home Survivors has said that the fact the Pope has asked for forgiveness is a step in the right direction. Speaking on RTE's Six One news, Chairperson Paul Redmond said that he had some sense of relief at the Pope's words. He said the Pope did address the fact that natural mothers "back in the day" were told that to seek to be reunited with their children was a mortal sin. Mr Redmond said he was delighted that the Pontiff had clearly said this was not a mortal sin, and said this represented a huge step forward for survivors. Abuse survivor Colm O'Gorman said that while the Pope has again acknowledged the harm caused by abuse there still was no mention of the cover-up of clerical abuse. Speaking on RTÉ's Morning Ireland, Mr O'Gorman said it was a shame that he had not spoken about the Vatican's responsibility for implementing and directing this cover-up. Abuse survivor Marie Collins said she did not get the answers she wanted when she met with Pope Francis in Dublin yesterday. She welcomed the fact that the Pontiff met with the survivors without any secrecy, addressed the issue of abuse in several statements and she said some survivors who were present got answers they were very happy with. Ms Collins said she believes Pope Francis is moving forward but not fast enough and not in a dramatic enough way. Elsewhere, a former Papal Nuncio to the US has called on the Pope to resign, saying he was aware in 2013 about abuse allegations against a senior US Cardinal. Archbishop Carlo Maria Vigano claims in an 11-page letter that he told the Pope about serious allegations against Cardinal Theodore McCarrick. Cardinal McCarrick, the former Archbishop of Washington, resigned last month over claims he sexually abused seminary students and an altar boy. There was no immediate comment from the Vatican. Additional reporting: Pat McGrath, Eileen Magnier and Tony Connelly.